Santa Cruz, California – Toadal Fitness is the first Santa Cruz business to take advantage of the new California Solar Initiative (CSI) Thermal Program for commercial businesses. 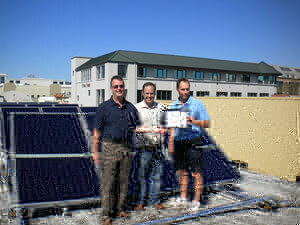 September 27, 2010 – Toadal Fitness will be among the first commercial applications of the CSI thermal program in the California, and the first commercial application in the City of Santa Cruz, according to Paul Burrowes, COO of Free Hot Water. To mark the occasion, a ribbon cutting ceremony took place on the roof at Toadal Fitness’ downtown location with Santa Cruz’s Vice-Mayor, Ryan Coonerty, who was on hand to recognize Toadal Fitness’ commitment to the environment and sustainable business practices. On January 21, 2010, the CPUC approved a Decision creating the CSI-Thermal Program, which allocates $350.8 million to promote SWH through a program of direct financial incentives to retail customers, training for installers, building inspectors, and a statewide marketing campaign. Solar Hot Water incentives are available to customers who currently heat their water with electricity or natural gas in the service territories of Pacific Gas and Electric (PG&E), Southern California Edison (SCE), San Diego Gas & Electric (SDG&E), and Southern California Gas Company (SCGC). The installation was performed by a team of solar professionals from Green Power of Santa Cruz, headed by Aaron Garfinkel. For nearly three decades, Santa Cruz has been hard at work addressing and curbing climate change, beginning in 1982 with the creation of a Solar Municipal Utility. More recently in 2007, responding directly to the Kyoto Protocol, the city, University of California at Santa Cruz, and Santa Cruz County (of which SC is the county seat) signed a joint climate compact pledging to reduce greenhouse gas emissions. From that compact came a set of General Plan policies for curbing climate change and the subsequent Climate Action Program that sets forth specific goals for reducing GHG emissions and outlines necessary actions for achieving those goals. The plan is to reduce citywide emissions by 30 percent by 2020, and 80 percent by 2050 (compared to 1990 levels). That includes all new buildings in SC being carbon-neutral by 2030. Progressive goals such as those require progressive action…and Santa Cruz knows all about progressiveness. The city is attacking climate change on all fronts, from transportation to green building regulations to land and water use to renewable and solar energy, sustainable living practices and beyond. A husband and wife team started Toadal Fitness. They are still involved in the day-to-day operations and have great enjoyment and fulfillment promoting and educating folks to enrich the quality of their lives through fitness. They often comment how blessed they are to enjoy their “work” as it doesn’t seem like working at all. Our goal is to help everyday people make a difference in their life by becoming healthier. A little bit of exercise (not too much) goes a long way. We feel the only way for the average person to start exercising regularly is to have access to a friendly and very comfortable environment where the fear of being out of place doesn’t exist. If you feel at ease when you come to work out, you will come back for more. In order to always meet the exercise needs of Santa Cruz county residents we consistently add new equipment and implement new programs. It has been, and always will be our intention to provide a clean, relaxed and comfortable atmosphere, which is ideal for adults off all ages to identify, achieve and maintain their fitness goals.